Beautifully presented apartment situated in a desirable neighborhood in Hobart. Lower Sandy Bay has a nice swimming beach, walking promenade, cafes, restaurants and shops. These are just 2 minute drive or a 10 minute walk from the apartment. The city is only 5km away. Safe, peaceful and quaint, you will love coming home to Moonrise View in Lower Sandy Bay. The fully self contained apartment is on the ground floor, it is soundproof and private. It has a separate driveway and entry and a private peaceful garden. It has a laundry with washing machine and dryer. Windows face north so the sunshine fill the rooms with light and warmth. The views through the garden also show glimpses of the river Derwent. You can relax in the undercover sitting area outside, have a BBQ or just enjoy the peaceful surroundings. We love Sandy Bay because it is quiet, beautiful and convenient to all the things you need. It is a very good and safe neighborhood. We ask our guests to keep noise down and respect our neighbors. Bus stop is 2 minutes walk from your door. Sandy Bay road takes you directly to the city in 10 minutes by car. Easy 25 minutes drive to the airport. Taxi costs approx. $50 to the airport. 1. Strictly no smoking inside the apartment. We provide an ashtray if you wish to smoke outside. 3. No parties or functions. Our aim is to make your stay as pleasant and as memorable as possible. Lovely property with everything you need and very comfortable. The breakfast provisions were much appreciated as we arrived in late. Great location, close to nice eateries and the Sandy Bay foreshore area. A visit to the Lipscombes Ladder is a must they have ready made meals and local produce including the famous scallop pies. Had a wonderful stay and highly recommended. Tucked away at the end of a cul-de-sac, this older-style 50s property is located underneath a larger home, and well-located for a stroll to Sandy Bay. The ground-floor flat has a cute outdoor area next to a peaceful garden, with a new Weber BBQ and acapulco chairs. Once inside, there's a good size wet area-type bathroom on the left, well appointed for those with disabilities. The shower was nice and hot, shampoo/conditioner, soap and fluffy towels provided. On the right, the bedroom has a lovely view over the garden and water beyond. Bed was comfortable with crisp white linen. 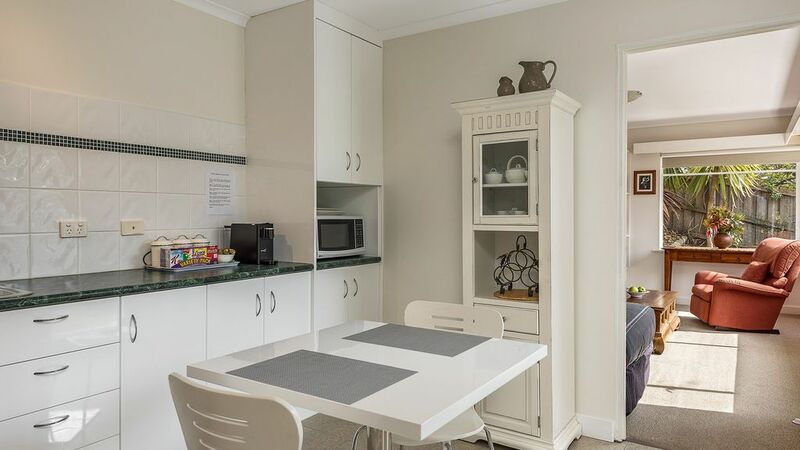 There's a clean central kitchen with all you need for a longer stay. The lounge area is delightfully sun-bathed with large wrap around windows taking advantage of the outlook. The couch is a bit old-fashioned but the room was adorable! There's also a single bed in the lounge which would be handy for a couple travelling with a child. In general everything spotlessly clean and very comfy and homely. Fantastic value and excellent communication with the owner. Although the house was reasonably positioned and comfortable we felt that it was under equipped. Although it had high end toaster, kettle and coffee machine the basic kitchen equipment was lacking, especially the frying pan which with its loose handle and badly bowed base was dangerous and virtually useless. The bathroom although very modern was not very practical with the shower getting everything wet. We loved this property and it wasn’t such a convenient location for us. Great place, exactly what we were after, lovely amenities, clean and comfy. Thank you! !